Hello, party people! This is it, the moment we’ve all been waiting for – hours and hours of retro-psychedelia aimed straight at your cochleae. 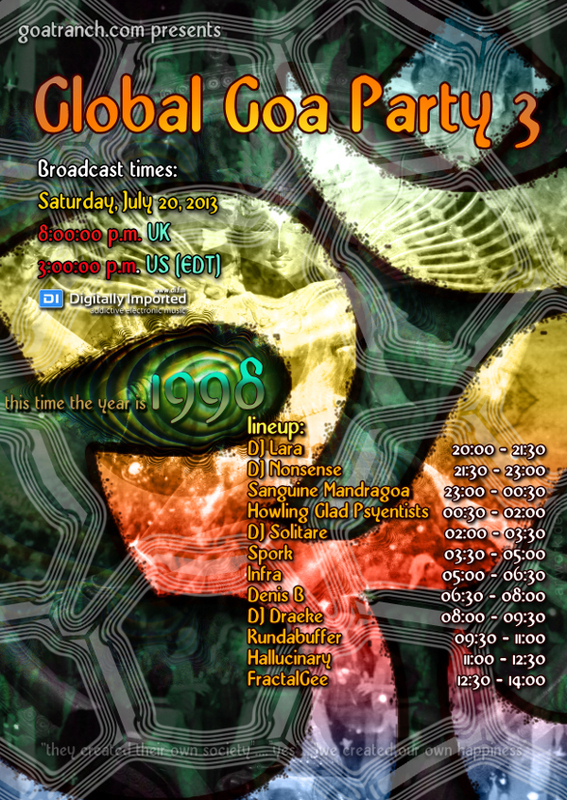 Welcome to Global Goa Party 3, we are so very happy to have you! There are a number of ways you can participate in this global hoedown beyond simply listening to the wonderful mixes contributed by the DJs. Pro-tip: If you sign up for a DI.fm account you’ll get a few days of commercial-free listening – avoid the ads between mixes and do this! Starting with last year’s GGP2 we decided to point everyone to the #goa channel on the DI.fm IRC server so people could chat during the party and it turned out to be a great addition. The web version requires Java and that you agree to a bunch of scary certificate warnings, but you can also use your favorite IRC client to connect, instead. As each mix is streamed on DI.fm it will get its own forum post on the DI.fm Goa/Psy forums. This is where the tracklists will first be posted, but only after the mix has played through in its entirety and the next is starting. And lastly, but not leastly, here are the mixes for your downloading and offline-stomping pleasure! NOTE: Tracklists will be posted in a separate post here on the Ranch after the party. playin now 🙂 !!! yea…not going to be able to party through the whole event though..very busy 2 weeks here…lovin’ it live 🙂 !!!! dunno if i’ve just warmed into it…but its high velocity amazin at this moment ….aaaarrrrr !!!!! *denn goes into a moment of nostalgic bliss…..
@oren sun: that is my goal, surprise with tracks that are unknown 🙂 I am happy to say i liked my set as well and i am dying to discover all the others. So far I only listened live to all the morning mix after mine (that is when i woke up, i tuned in) as unfortunately i could not be there to listen to anything during the whole saturday, but as far as i have read, everyone enjoyed it so much! Blast from the past! !